​The media, and many other members of the community, as well as those around the world have been incredibly kind, and very supportive of Ricochet's fundraising campaigns. 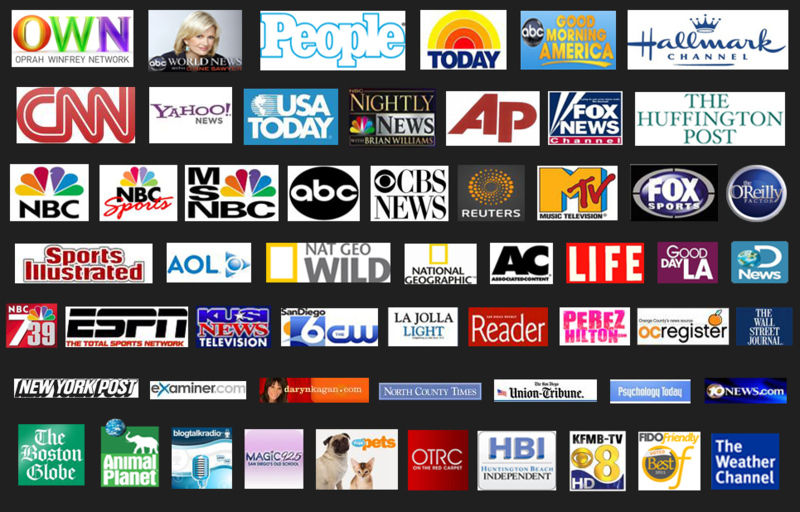 They help her raise awareness of her causes through the articles they write, news segments they produce, video clips they post, blogs they create, Facebook entries, tweets they post, and so much more. It's all these amazing folks that have helped Ricochet raise awareness for her charitable causes, and we'd like to sincerely thank each and every one of them for their support! With their help, thousands and thousands of dollars have been raised for Ricochet's causes. 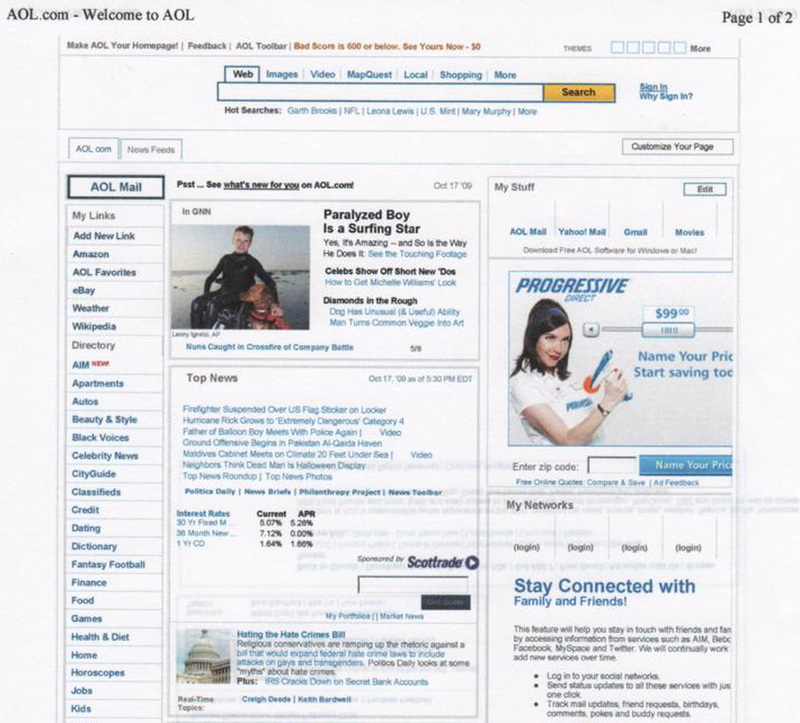 Her fundraising activities, causes she works with and her surfing have also been featured in thousands of local, regional, national, and international sources. Ricochet was also used as an extra in the movie, Marmaduke, and appeared in an MTV special called "Made"! 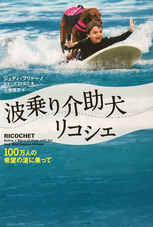 ​Want to write about Ricochet's work, surfing or causes? 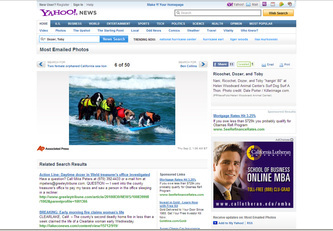 Want hi-res photos for your blog? Want to learn more? Just email us! Ricochet is one of five dogs in the IMAX film, Superpower Dogs. Click the video below to watch the trailer. 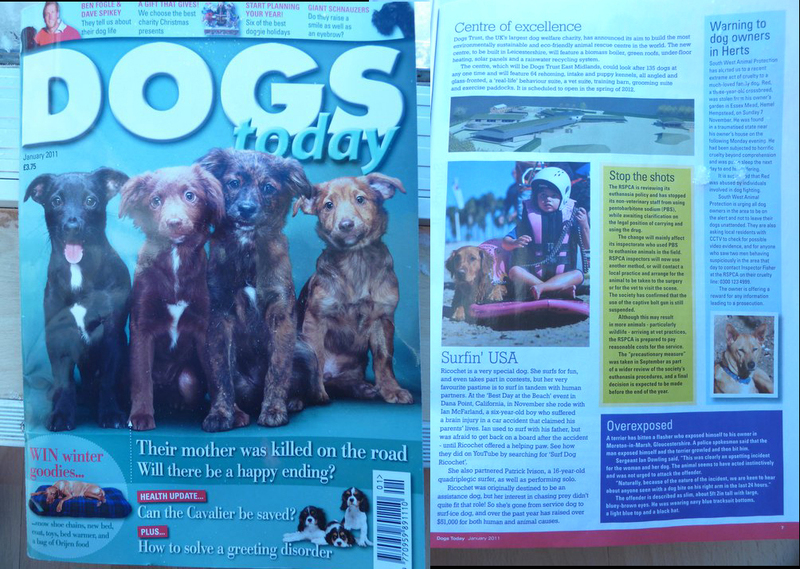 Surf Dogs calendar 2010, 2011, 2012, 2013 and 2014. 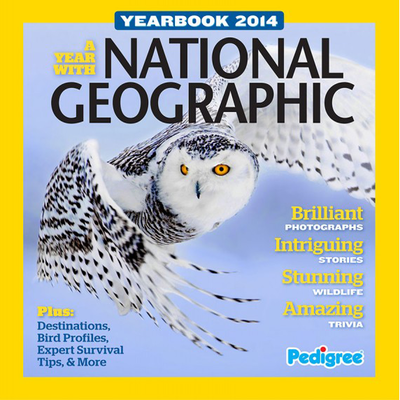 My non fiction book published in the US & Japan! 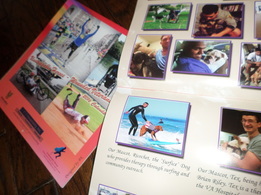 The charitable SURFice dog® work Ricochet does is featured in these books!!! Most people who watch the inspirational video below are brought to tears. It has been watched by more than 14 million people on Facebook & Twitter. 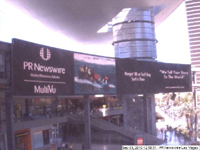 From red carpets to movie sets to award shows and more, I've met a number of pro surfers and celebrities such as Gary Sinese, Betty White, Glenn Close, Diane Keaton, Kelly Slater, Cold Play and many more which you can see at this link Wall of Fame! Click here to see Ricochet with some Reality TV Stars! 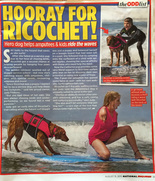 Click here for pictures of Ricochet with some pro surfers, including 10 time world champion Kelly Slater! Josh Duhamel Awesome work! Great cause! Amazing dog! 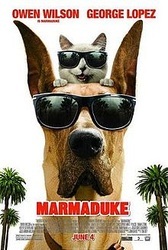 Josh Duhamel What an awesome dog & story. Kudos! 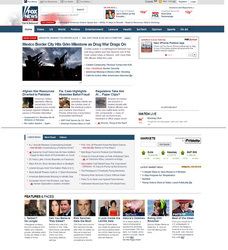 Is Wounded Warriors the charity Ricochet would like me to donate to? Bailee Madison ‏@BaileeMadison @HaileeSteinfeld & I had such an amazing time w/ @SurfDogRicochet :) u did such an amazing job in @magicbracelet 4 paws up Lots of kisses! 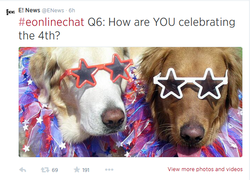 @SurfDogRicochet @GMA congrats!!! Miss you too! 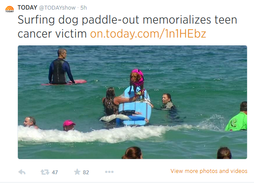 @SurfDogRicochet our segment is on Tuesday on @GMA !! 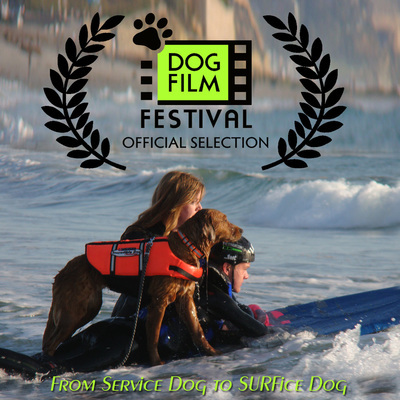 ​﻿@Victoria Stillwell ﻿@SurfDogRicochet Congratulations, Ricochet - can't wait to meet you at the @AmericanHeroDog Awards, too!! Country singer, Jo Dee Messina included Ricochet on her April 22, 2010 podcast. 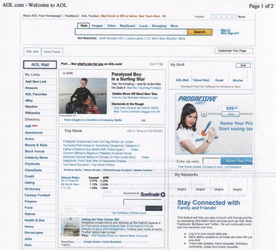 She showcased her SURFice dog® video, and Pawing it Forward video too. Ricochet's part starts at 44.36 of the podcast that day. 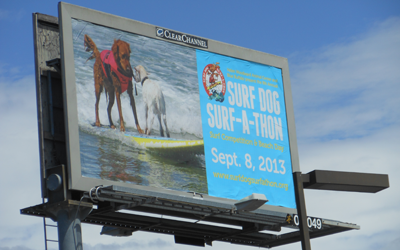 Surf Dog Ricochet & Aqua Dog Cori is totally rad! 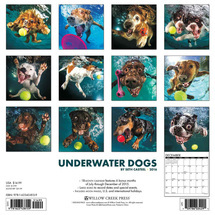 A doggy paddle does it! 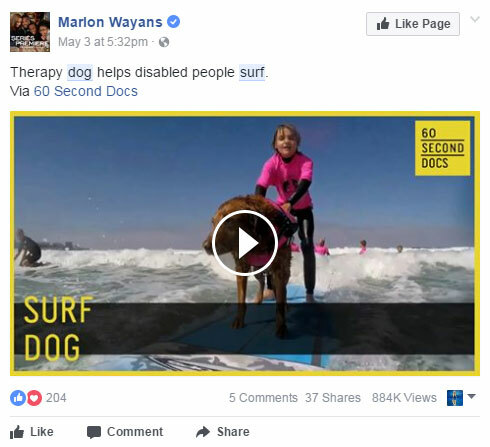 This Famous Surfing Dog Rides The Wave To Helping Others! Ricochet is the most amazing dog! The most amazing program for veterans and disabled children! 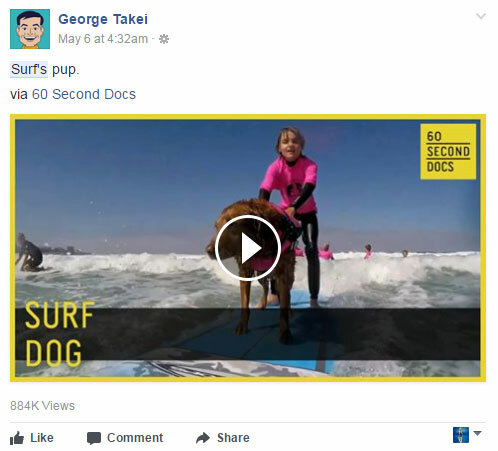 Surfing or Kayaking – Dogs can join you, here’s how! 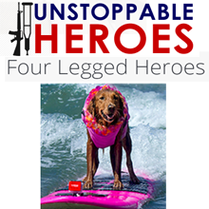 urfing dog teaches disabled kids and vets with PTSD to surf! Surf Dog Helps Kids With Special Needs Doing This Amazing Thing! 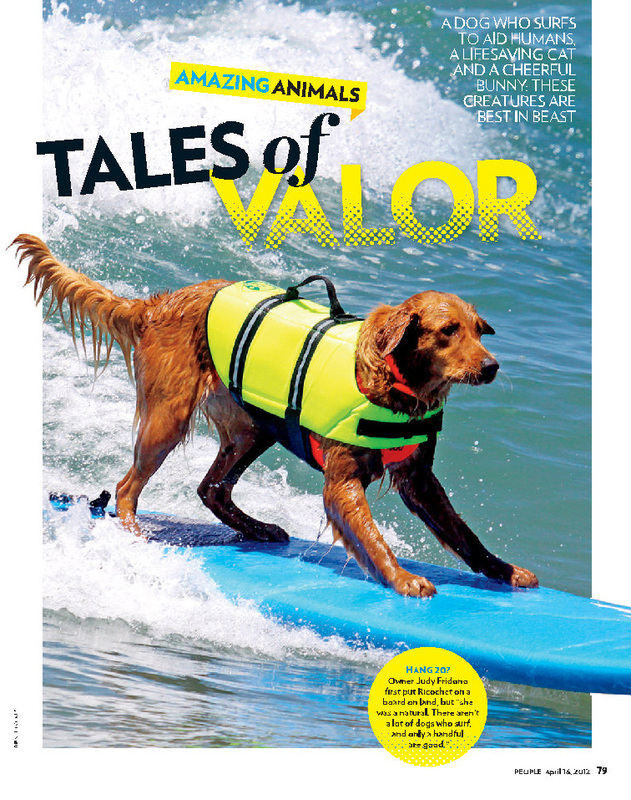 Surf Dog Helps Combat Vets With PTSD Mentor Kids With Special Needs! What She’s Doing With This. Incredible! 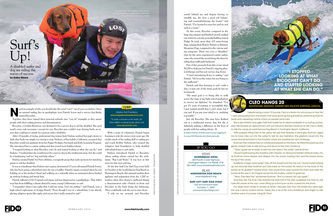 Surf dog & boy with autism help disabled kids catch waves of empowerment! his video will amaze you! since she started fundraising six years ago. SURFice dog Ricochet: The Little surFUR Girl! Meet Ricochet the Surf Dog! You've never seen a doggy paddle like THIS! Mom Knew Her Dog Was Never Going To Be Service Dog, So She Taught Her To Do THIS! Unbelievable! Heartwarming Footage of Surf Dog Helping Boy with Autism Overcome His Fear of The Ocean & Dogs! Autistic Boy Refused To Socialize, Then Surfing Dog’s Unexpected Friendship Changed His Life Forever. 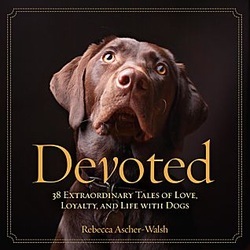 On National Dog Day and every day, Ricochet creates joy! So She Found THIS Unusual Way To Help Out! 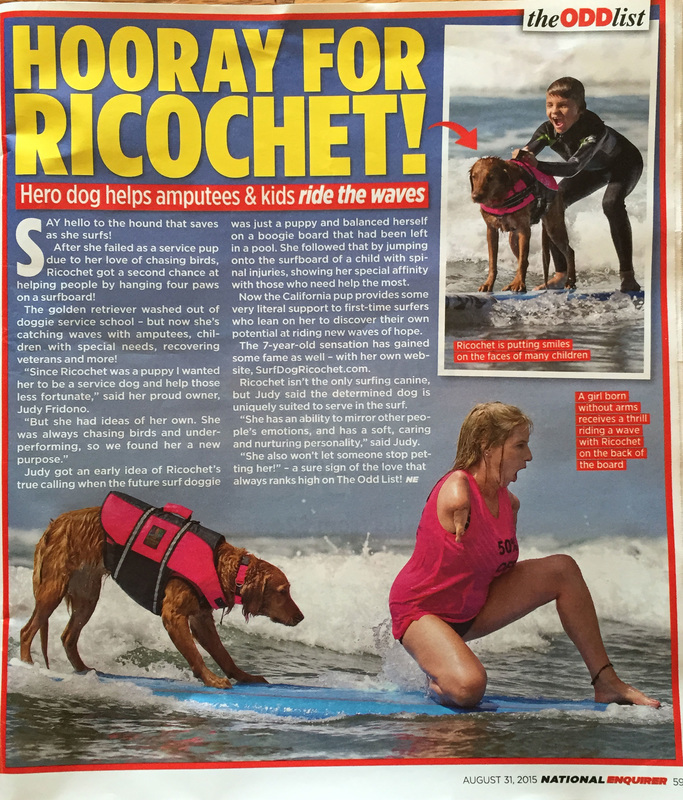 Surf Dog Ricochet And Her Cause Are Unstoppable! 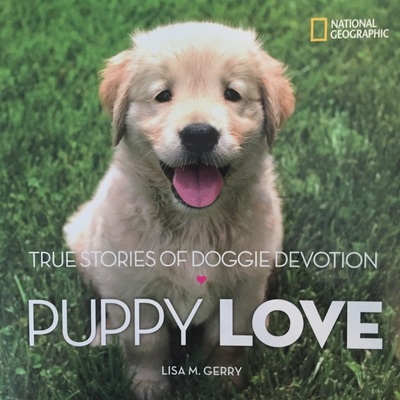 This Puppy Will Teach You More About Life Than Anyone Else Has Done In A Lifetime. INCREDIBLE! Service Dog Who Failed At Her Mission Becomes Something Amazing! This Mischievous Therapy Dog Won't Stop Playing Pranks on "Elf on the Shelf"
Silly Golden Retrievers Wage All Out War Against Elf On The Shelf! Celebrity Golden Retrievers Ricochet and Rina and the Elf on the Shelf! Dog vs. Elf on the Shelf: Who will win? But Her New Career Is Even MORE Incredible! These Dogs Have HAD IT With Elf On The Shelf! They Said She Could Never Become A Service Dog, But You Won’t Believe What She Does Now! This Dog Failed To Become A Service Dog. But What Mom Decided To Do? I’m In TEARS! She Was Trained To Become A Service Dog. But What Happened When She Failed? Unbelievable! Puppy Destined To Be A Service Dog Has Now Become A Global Icon For Disability Awareness! Get Some Doggie Inspiration This Halloween! 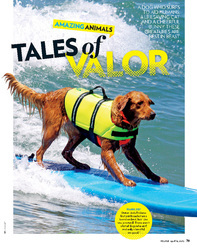 Conquering Waves The Dog That Can Surf Is Inspiring Millions With Hope! 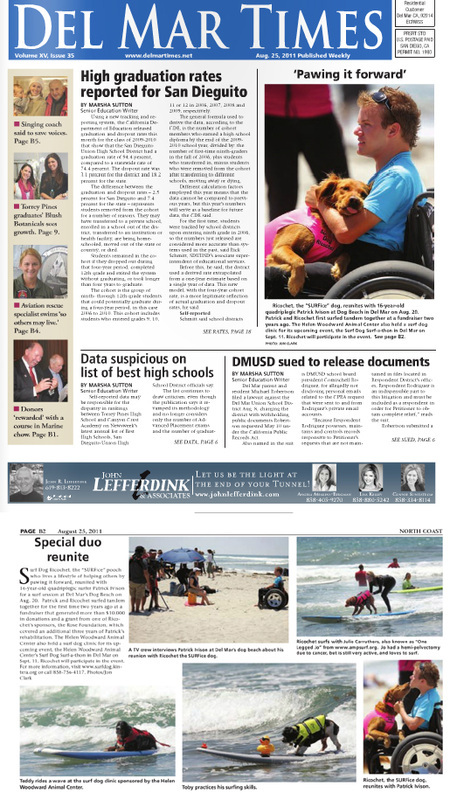 Perspective: Surf Dog Thrills Dying Sisters! 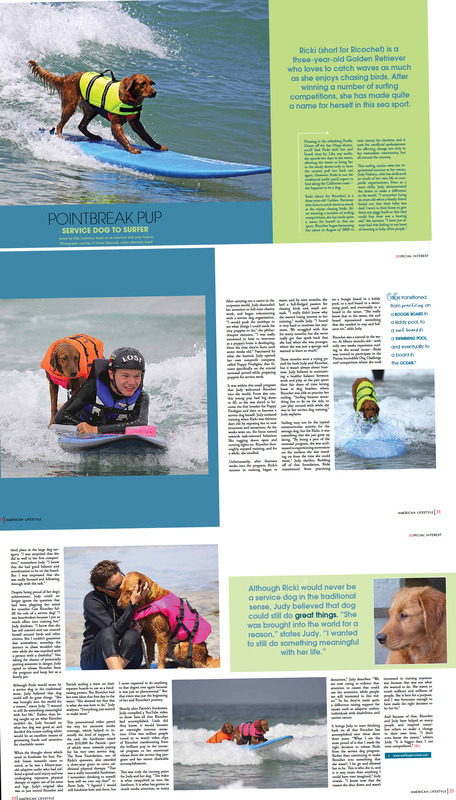 Dog Surfs in 1st Ever Adaptive Surfing Championship! What They Do For This Disabled Boy Just Warmed My Heart – Amazing! 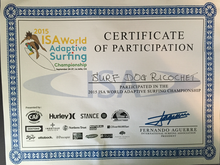 Ricochet The Golden Retriever Gets Invited To ISA World Adaptive Surfing Championship! Ricochet finally found her calling, and helps disabled kids! 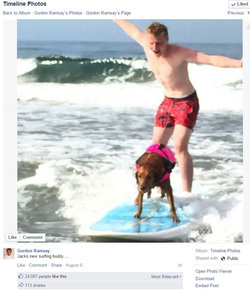 Surfing Dog Helps 4 Year Old Boy With Debilitating Illness Ride The Waves! Two Sisters With Same Terminal Illness Catch Waves With My Surfing Dog! It was the Opportunity of a Lifetime for two Terminally Ill Sisters. 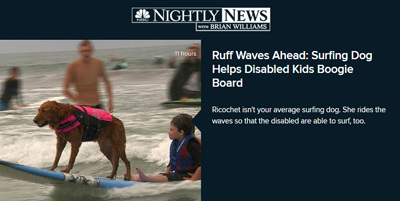 Ricochet, The Surf Dog, Helps Boy With Autism Overcome His Fear Of Water And Dogs! 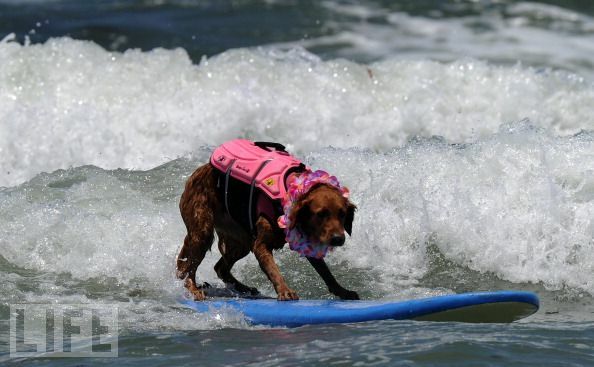 Dog Finds Her Calling For Surfing–And Helps Those With Disabilities While Hanging Ten Together! 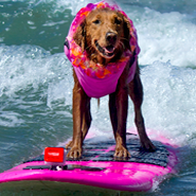 17 Ridiculously Impressive Surfing Dogs You Have To Check Out! Therapy Dogs: Lets Share The Love! Adorable Golden Retriever Riding A Wave Of Hope For Those In Need! 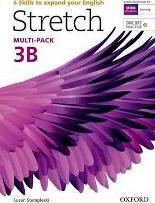 Win a Copy of Ricochet! Coincidence allows Surf Dog Ricochet to bring two Jacobs together to surf with one "perfect heart"
Caring Causes: Surf Dog Ricochet "Waves of the Heart"
The Angel Disguised as a Dog! Better than a doggy paddle! Ricochet The Selfless SURFice Dog Splashes With A New Book! Teen Fighting Brain Cancer's Make-A-Wish Dream Comes True Thanks To Surfing Dog!! Is Your Dog Therapist Material? Think Your Dog Can Surf Like These Pro Pooches? 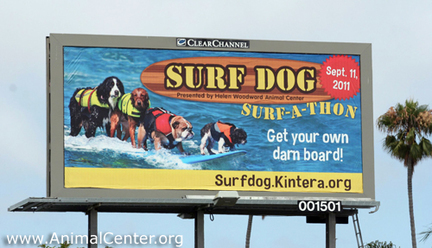 Fiesta del PAWS 2012— Surf’s Up San Diego! Will LIKE for food - Ride the Wave! 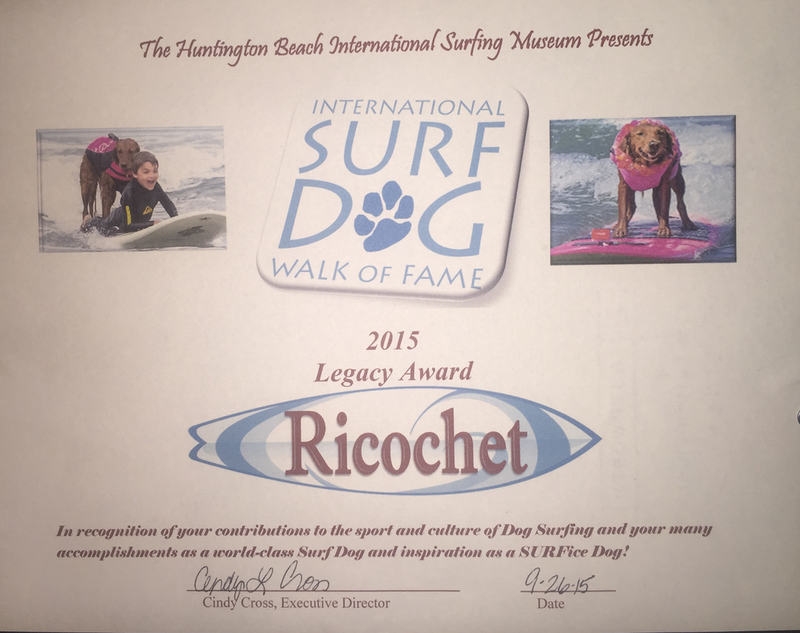 Help Surf Dog Ricochet Earn Food for Homeless Pets! Ask the Expert: How do I Teach My Dog to Surf? 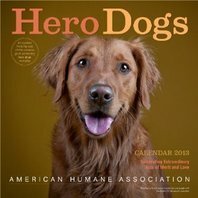 American Humane Association Hero Dog Awards. Celebrities Celebrate at the First Annual "Hero Dog Awards"
Which of These 8 Canines is Most Amazing "Hero Dog"? Which of these 8 canines is most amazing ‘hero dog’? 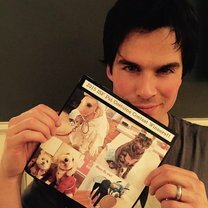 Celebrities Pitch in for ASPCA Extreme Shelter Makeover: Adoption Success! 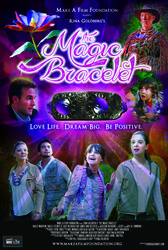 Episode about Kenna, a girl who's hearing impaired is inspired by Patrick & I sufing! Disabled Kids Catch a Wave At Doheny (click on "more photos" to see a couple of me with the kids"
Help Surf Dog Ricochet Take a Bite out of Breast Cancer! Teddy Hilton - Perez Hilton's dog! 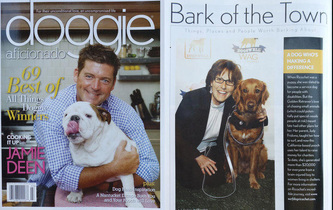 Dog Raises More Money for Charity Than Reality Stars! 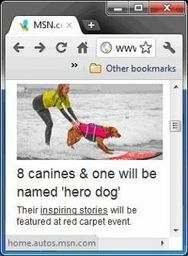 Hero dog Target nominated "Most Heroic Dog of 2010"
Cowabunga Canine Hits La Jolla Waves - A four legged philanthropist named Ricochet is a welcome addition to the surfing community. 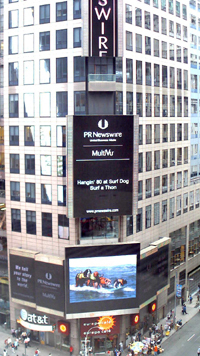 Press Release photo for the Helen Woodward Surf dog Surf-a-thon. Dog Days of Summer Requires Work? 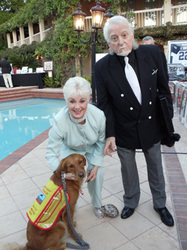 SURFice dog® Ricochet Aids Pet Food Drive - So Can You! Famous Dogs with Friends on Facebook! 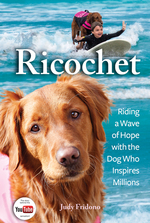 Ricochet Ricki is a golden retriever who loves to catch some waves on the sea. That's right, no common toys. What she really prefers is a good surfboard. 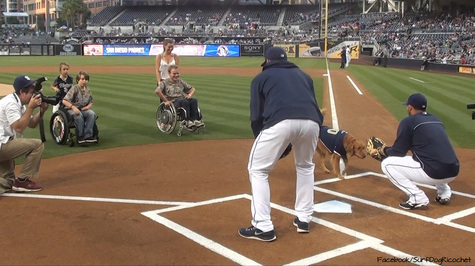 The dog was trained to assist people with special needs as part of a program created by an association in San Diego, USA. But, she was more interested in chasing birds, so she changed her function and started to help people through the sport. With eight weeks old, she already used to practice bodyboard in a pool. Today she participates in canine surfing championships, helping to raise funds that benefit people and athletes with special needs, pets, among other causes. The golden retriever collected U$$ 22,000 in just eight months. Surf Dogs Hang 20 at Loews Competition! 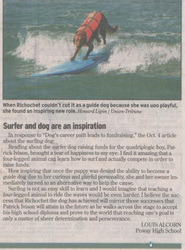 San Diego Meet Ricochet, a Remarkable Dog With a Calling... and a Surfboard! Lend a Paw, and "Be the Change"
10 Amazing Videos of Dogs Hangin' 20"
Arden Moore, the amazing woman who wrote the article! 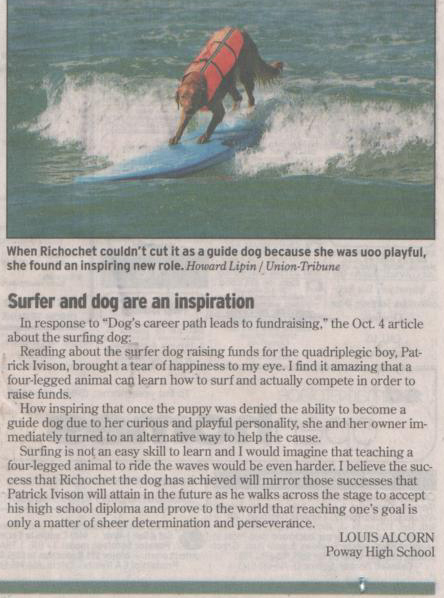 Rip Curl Ricki, the Surfing Dog (Finding inspiration in watching one dog change the world by doing what she loves). 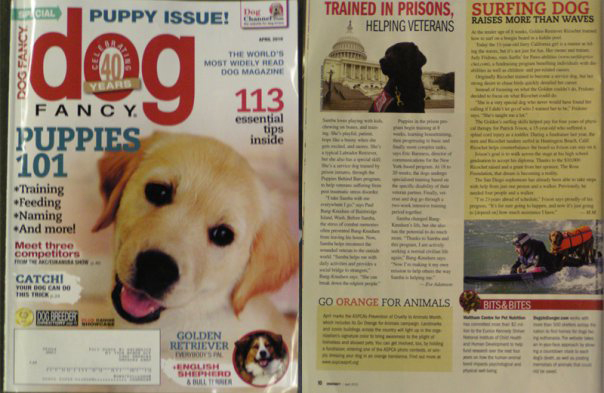 Arden informs readers about my Surfin' Santa Paws toy drive, and how they can donate! Riding the waves with Ricochet pays off for Patrick! 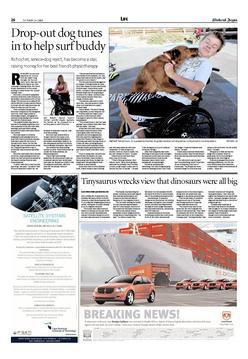 Cape Argus - South Africa! Surf Dog is Quite the Best Friend! 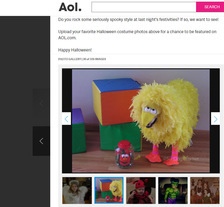 Patrick and I were on the front page of AOL!! Along with Harrison Ford, and Tyra Banks. 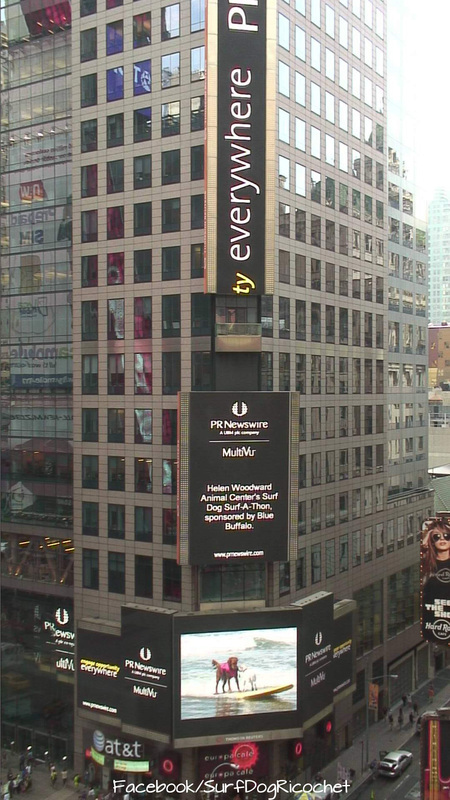 How cool is that?!! 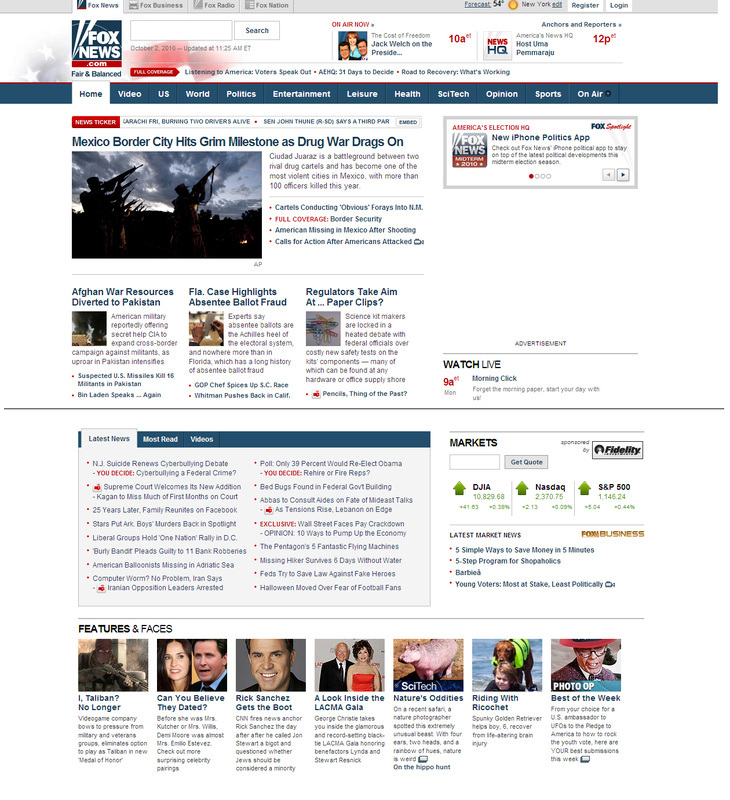 Click the icon above to check it out! Earlier this month (October 4th) was World Animal Day. Started in 1931, the day was set aside to celebrate animal life in all its forms around the world, and humankind's relationship with the animal kingdom. There are 41 photographs of animals around the world, at play, at rest, at work and more, taken over the past several weeks. There are a couple pictures of Patrick and I... #37 & #38! 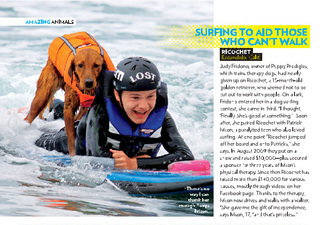 Paralyzed Boy and Dog Team up for Tandem Surf. The pictures Laylan took really capture the essence of each moment, especially the teamwork! 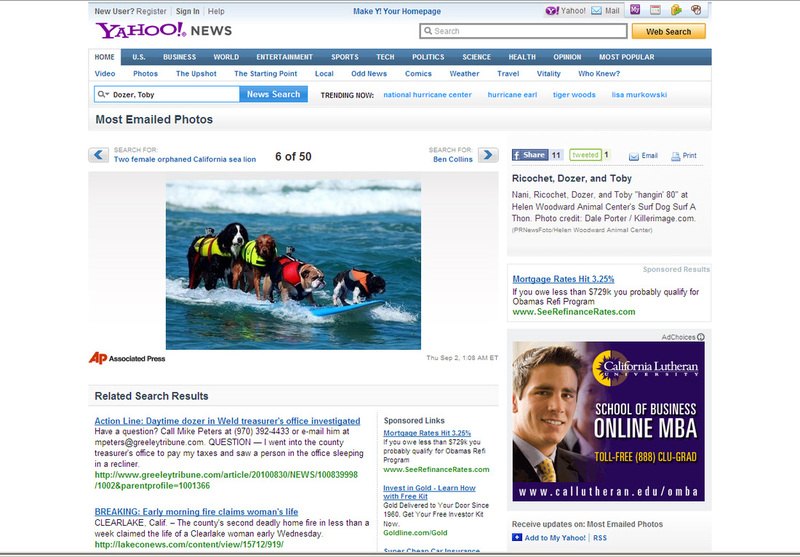 I was picked as video of the week for my tandem surfing video with Patrick!! Reprint of Examiner article "Incredible tandem surf team: 15 year old quadriplegic surfs with Golden Retriever"
Channel 8's Charles Landon touching story. Tissue alert! Charles really got into the story... by going in the water with his water camera, and riding a boogie board right alongside me and Patrick to get some close up action! It was so cool. 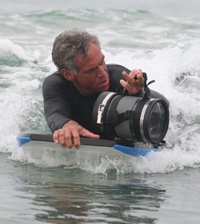 And, not only did Charles get in the water to film... he also became part of the team, and helped us! He is the epitome of a surf dog's best friend! 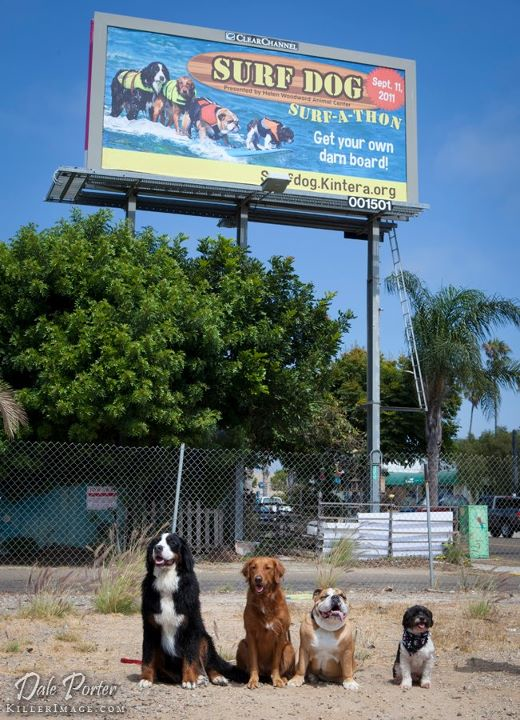 Nani, Ricochet, Dozer & Toby posing with our billboard!